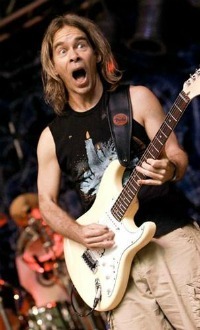 Tim Reynolds is a ridiculously gifted guitarist, but he has so much fun at his craft and sparks such great things from his cohorts that he doesn’t always get the shredder cred he deserves. Sure, amphitheatres of Dave Matthews Band fans know the score, but that’s just one aspect of this full spectrum musician, whose appetite for metal, jazz, prog and more infiltrates his work with his trio TR3. What also makes Reynolds a standout is how adept he is on both electric and acoustic guitars, a worthy (and rare) walker of the narrow path John McLaughlin began cutting in the 1960s. His work is marked by Reynolds’ gift for flavorful melodies combined with an attack full of sharp bite and interesting changes, offering a smooth yet suspenseful ride. And his aptitude on a range of instruments – percussion, sitar, keys, mandolin, to name but a few – gives his ears and fingers a different lilt than players only skilled at guitar, a trait that keeps the sonics of his music interesting and filled with gently unexpected flashes – something particularly noticeable in his delightfully unorthodox slide work. Plus, he’s one of the few guitarists capable of making one forget about all of Jimmy Page’s multi-tracking when he tackles Led Zeppelin with TR3. In short, this man is serious business who doesn’t need to carry a big stick to impress. He just does what he does really, really well. It’s a treat to offer a slice of Mr. Reynolds mind to DI readers. My favorite effects pedal is the Moogerfooger Ring Modulator. It really has its own language from outer space. I’m trying to learn. Buddy Miller. Great playing on Band of Joy, Robert Plant’s latest. Jimi Hendrix Band of Gypsies’ “Who Knows”. It has like three guitar breaks, all amazing; the last one is from another planet. Gibson guitars are great; they make so many classic guitars. They always sound full and solid. Also love Fenders and Martin guitars. Different guitars make you play different; they bring out different aspects of feeling in the music. The Beatles. They were the first music I was wild about as a kid. So many great guitar tones and solos throughout their evolution. Greatest songwriting ever. Yamandu Costa. A really amazing Jazz Samba guitarist from Brazil. He plays an eight-string nylon acoustic guitar with complete mastery. Really great! The fact that it connects me to the dreamworld of music and the freedom of expression.